At KSA we practise times tables through rolling numbers (call-and-response chanting the times tables while counting off on our fingers as we go). 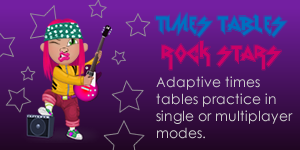 The physical movement combined with the catchy chants help to energise the class, give us the chance to be loud in maths (that’s a good thing) and ultimately support faster recall of the times tables. Hello, this looks great. Is there a rationale behind doing the numbers in this order with 9’s starting off and 4’s last? Are there any nifty tunes for 2’s and 5’s also for the younger ones? The 9s seemed to be one that they had success with when I first started doing it, so I wanted to capitalise on that and begin with 9s. I felt that 2s and 5s were too easy and wanted to spend our time doing all the others. As for leaving 4s to last, it’s the most complex of all the rhythms so I left it to the end once we were confident on the others. If you make one up for the 2s or 5s, let me know! Harriett Ball is in my teaching hall of fame. She inspired me a great deal as a teacher, particularly in the early days of setting up King Solomon Academy. I spoke to her on the phone once. She was incredibly passionate. Regarding adult maths classes and times tables, I’d be happy to introduce you to another legend teacher I know who began Times Tables Rock Stars with her adult learners and one of them has gone on to be one of the website’s highest scorers. It’s transformed her self-efficacy and attitude to maths now that she’s started to feel successful. Let me know, and I’ll put you in touch by email. She works in Essex. Thank you so much for sharing. I have always believed you need facts at your fingertips to have confidence in solving maths problems and performing calculation effectively. Always looking at ways to make it fun. We have regular 1o minute tests with children working at their appropriate level in the same classroom. We have a timer running and the children note the time they finish within the 1o minutes. Doing their own paper, the aim is to get more marks and/or perform more quickly so the only challenge is for them to be better than last week. Marking can be a bit of a chore but i often group the workers so that they can mark them together themselves from an answer sheet for each test. Not their own papers tho! Once they find a particular set of tests easy, we add more tables, increase the number of questions or declare them LEARNT! I do all this stuff with my class too but the children choose the actions. They love it!